The Northwestern University Nervous System Tumor Bank (NSTB) provides researchers with high-quality patient-derived biospecimens (tissues, cells, blood, and cerebrospinal fluid) to support preclinical and translational neuro-oncology research. We offer a comprehensive platform for biospecimen and data banking, including protocol and informed consent tracking, sample annotation, inventory management, tissue microarray construction, and integration with sample processing and analysis technologies. The NSTB is funded in part through Northwestern University’s NCI P50 SPORE in Brain Tumor Research, as well as through the generous support of the Lou and Jean Malnati Brain Tumor Institute. The NSTB works closely with the operating room teams and the pathology department to collect brain and spinal cord tumors in a timely and efficient manner. The IRB-approved protocol for the NSTB can be viewed here: NSTB Collection Protocol. NSTB services fall into the broad categories of specimen acquisition and annotation, histology and immunohistochemistry, specimen distribution, honest broker services, and digital imaging. The NSTB provides fresh patient-derived tissues for targeted projects involving cell culture and xenograft development. 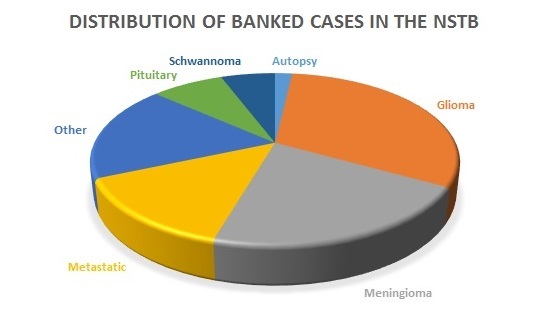 Patient matched blood and tumor tissue is available for many of the NSTB samples. All biospecimens are annotated with demographic, molecular, pathologic, and clinical data. The NSTB provides comprehensive histology services for human specimens and for animal tissues that include necropsy, phenotyping of organs and tissues, dissection and tissue processing, and interpretation. Consultation with Dr. Horbinski, the NSTB Director and a board-certified neuropathologist, is available to all Northwestern researchers studying nervous system tumors. Currently, the NSTB supports over 80 brain tumor projects by over 20 investigators within and outside Northwestern University. To submit a request for research specimens, please complete the NSTB request form (pdf download) and submit it through the NSTB Disburser website. For non-Northwestern researchers, please email the form to nervous.system.tumor.bank@northwestern.edu. Requests are reviewed monthly at the NSTB committee meeting. The NSTB works with NUCore for the billing of our items and services. The NUCore website can be found here: https://nucore.northwestern.edu/facilities. The NSTB has established an online database to house the growing the tissue collection utilizing REDCap. Efforts to link de-identified clinical data to biospecimens are ongoing. Access to this database can be requested through email to the NSTB research team. Access is only available to Northwestern researchers.